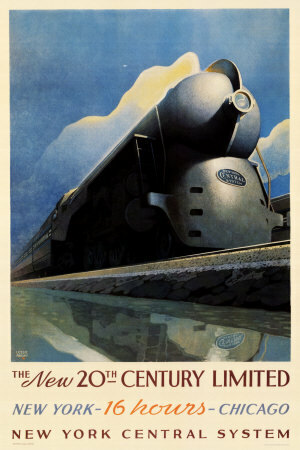 Not since the golden age of rail, has anyone traveled between New York and Chicago with such ease and comfort than our Scott. A Rangers man by birth, he always had a soft spot for the Hawks. And if we read between the lines, it was a childhood crush on Jeremy Roenick that was responsible for that. I mentioned in my first post that the NY Rangers have and always will be a team that I root for, being that I am a born and raised New Yorker. By saying that I assume that it can be deduced that the Rangers are not the only team that I cheer for. I am not of the belief that a person can only be a fan of one team in a league. I think considering the circumstances in the NHL in particular it is actually very easy and simple to do so. The reason for that being that there are two conferences, East and West, and three divisions in each of those conferences. Rooting for a team in the Eastern Conference as well as one in the Western Conference does not really create any conflicts as the teams from two conferences only play each other twice during the regular season, so you only have two games to worry about. There is also no issue of the two teams battling for position in the playoff race (with each other). If you want to cheer for two teams in the same conference it gets a bit more complicated, considering positioning for a playoff race and that the teams will play each other more often. But I believe it is doable! You just become schizophrenic on days when the teams play each other. No big deal …. Yes it is! …. No it is not! …… … see, all good. One (of two) other team(s) that I love is the Chicago Blackhawks. To be honest, I have actually been a Blackhawks fan longer than I have been a Rangers fan (or a fan of any other team for that matter). I cannot remember exactly why, as a child, I decided to root for the Blackhawks but I can narrow it down to two things. One, is Jeremy Roenick. 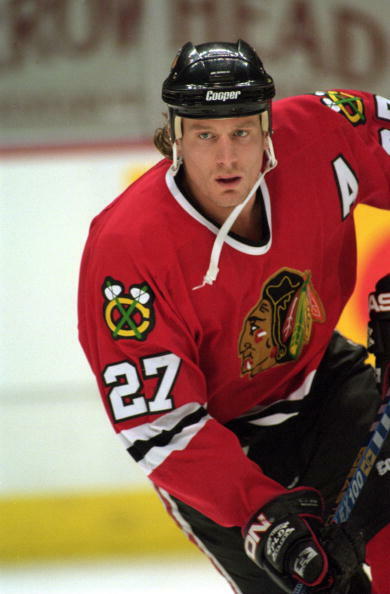 Jeremy Roenick was the first athlete that I became obsessed with. It was difficult to watch him play since he was on in Chicago and living in New York City my parents’ TV mostly got only the New York sports games. Plus, the Chicago Blackhawks, under owner Billy Wirtz, did not televise their home games making it difficult for anyone, including fans in Chicago itself, from watching games (that only changed starting in the 2007-2008 season when a select few home games were televised and then in the 2008-2009 season all 82 games were televised). Yet, the first time I saw Roenick and the way he played the game I was hooked. I remember as a child going into the local sports stores with my parents and asking them if I can get a Roenick jersey only to be told that because we lived in New York that none of the stores carried the Blackhawks jerseys, let alone one with a player name on it. I tried watching as many Blackhawks games as I could, even when they were doing poorly. When I began going to Rangers games, the first thing I would always do is check if and when they were playing the Blackhawks. The other reason I got into the Blackhawks was their jerseys. I loved the red, black and white color scheme and the indian head has been their icon forever and become a classic. It is a fact that the Blackhawks’ jersey has been voted one of the top 25 jerseys in ALL professional sports and has been voted best jersey in the NHL several times by The Hockey News. 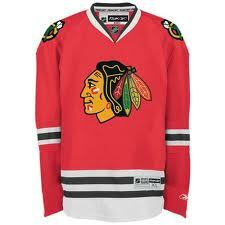 Coming out of the lockout, the Chicago Blackhawks were in the need of some changes. The 21st Century did not start well for the Blackhawks. They had poor performance, low attendance numbers, and were voted in 2004 by ESPN as the worst team in professional sports. GM Dale Tallon tried making some off-season moves to make a playoff run in the first season out of the lockout but the team finished 14th (out of 15) in the Western Conference and as the second worst team in the NHL. However, there was light beyond the horizon, though it would not show for another year with the 2007-2008 season. In 2006, with the 3rd overall pick the Blackhawks drafted Jonathan Toews. 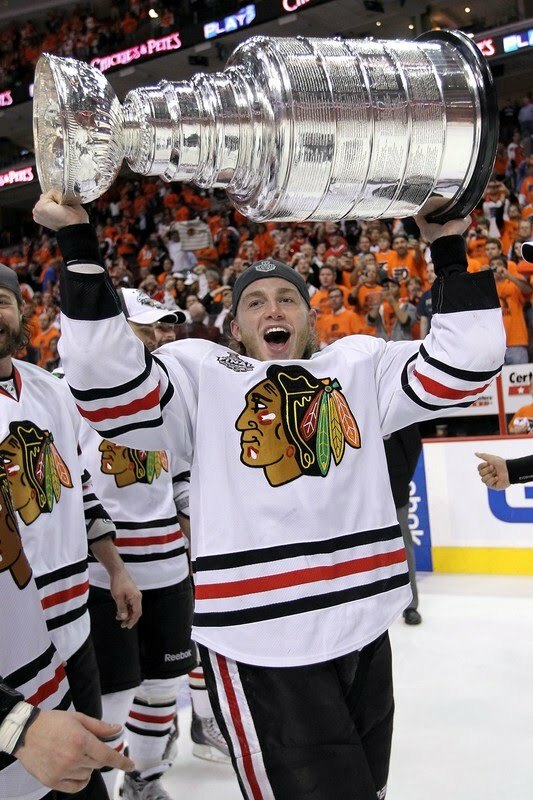 Then in 2007, the 1st overall pick the team drafted Patrick Kane of the London Knights of the Ontario Hockey League (OHL). The 2007-2008 season started off with big changes for the Blackhawks. With the passing of long-time owner Billy Wirtz, his son Rocky took over and began instituting change. All of the team’s games would now be televised through a partnership with Comcast SportsNet. 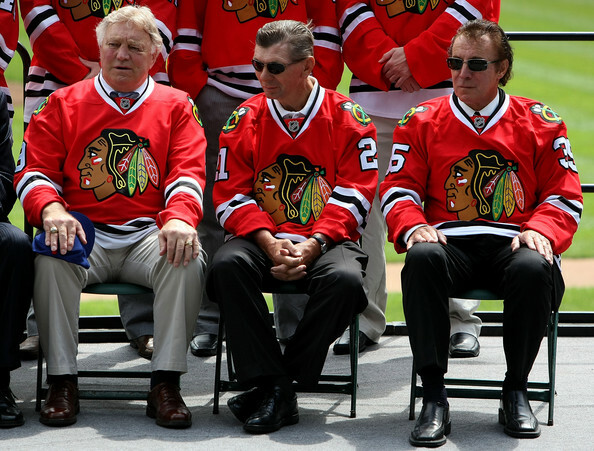 The organization brought back retired Blackhawks greats Tony Esposito, Stan Mikita and Bobby Hull as the team’s “hockey ambassadors” to show fans that the good times of the past were not forgotten and could return. The 2007-2008 season would also be the debut of Jonathan Toews and Patrick Kane. Both had tremendous first seasons and were finalists for the Calder Memorial Trophy (rookie of the year award). Toews lead all rookies in goals and Kane lead all rookies in points. Kane ended up beating his teammate and won the award. The team missed the playoffs by just 3 points marking the first time in six years that they finished above .500. Since then the team has done supremely well. Jonathan Toews was named team Captain in 2008. The team was chosen to participate in and host the 2009 NHL Winter Classic. They had a huge playoff run only to lose in the Conference Finals against long-time rivals the Detroit Red Wings. They had another great season in 2009-2010. This time they ran through their opponents in the playoffs and made it to the Stanley Cup finals to face the Philadelphia Flyers. It took them 6 games to defeat the Flyers and they did it with somewhat dramatic fashion. The game was in overtime and tempo was high. Patrick Kane took a difficult-angled shot from the left corner of the rink and then no one knew where the puck was. Except one person. Patrick Kane began skating toward the other side of the rink, throwing off his gloves and stick, and jumping up and down. The puck was in the net. The Chicago Blackhawks continue to be a top NHL team and have a huge fan following. They go through some rough patches, like their recent 9-game losing streak, but can always turn it around, like scoring 4 goals within ten minutes of the first period against the NY Rangers (winning the game 4-2 and ending the losing streak). That was a difficult game for me to watch, having a schizophrenic episode of whom to cheer for. But I knew I would come out happy either way, no matter who won. This entry was posted in Chicago Blackhawks and tagged Chicago Blackhawks, Jonathan Toews, More shirtless NHL players, Patrick Kane. Bookmark the permalink.